At 51, Dan Lies lost everything. Now, 18 months later, he’s slowly winning his life back through hard work in Jamestown Regional Medical Center’s Rehab Department. Dan has been active throughout his life. He and his family live on a farm 10 miles south of Jamestown, where he and his wife Nancy have raised four children — April, Robert, Erika and Bethany. He spent 15 years at Weedbadger in Marion, N.D., ultimately as its shipping manager. “After he’d basically worn out both of his shoulders from lifting,” says Nancy, “he was ready for what he called his ‘pre-retirement job.’” He went to work as a clerk at Bottles and Jugs in Jamestown. Father Peter Hughes gave him last rites during surgery. After ten days in the hospital, however, Dan still hung on. He was transferred to Triumph, an acute longterm hospital and had inpatient rehab therapy at Sanford. Finally he was moved to Ave Maria Nursing Home for three months. Nancy brings Dan to JRMC for outpatient therapy in the Rehab Department. “It’s been hit or miss, whether we get there or not because of his depression,” she concedes. “He has always been stubborn. With the depression, now it’s really bad.” A new piece of therapy equipment called an AlterG treadmill, however, has improved the situation. Nancy learned about it first from Tracy Anderson of JRMC’s Rehab Department, who worked with him at their farm for about a month. Impressed by what they had seen, Nancy brought the idea of AlterG to Jan Barnes of JRMC Foundation. “We made a donation toward acquiring one. I wanted her to understand that I was truly interested in the machine,” she confides. Now Dan is getting the good cardiovascular workouts he needs without the risk of injury. AlterG supports much of his weight during his sessions, allowing him to increase his mobility and balance without worrying about devastating falls. The therapy has definitely helped with his walking. His wife, too, reports that he seems somewhat happier and more alert, taking more initiative in pursuing daily activities. Along with the new equipment, Nancy is quick to credit JRMC’s rehab staff with her husband’s improvement. The Lieses have been married 28 years. Their youngest daughter, Bethany, is still at home, attending school in Montpelier. April, Jamestown, is a sterilization tech at JRMC. Robert, a machinist, lives in Elk River, and Erika is attending college in Wahpeton to become an LPN. The JRMC Rehab Department’s new AlterG antigravity treadmill shares something with WD-40, artificial hearts and cordless power tools: Its roots are deep in the American space program. NASA was looking for ways to enable astronauts to exercise in space, where weightlessness works against the load-bearing effect of earth-bound running and walking. It was designed to add weight. But back on Earth, the AlterG rehab treadmill has proven its worth in a completely opposite way. It lightens (or “unweights”) patients, carrying as much as 80 percent of their weight. They step into an inflatable chamber that hugs them from the waist down. It enables them to run or walk freely on the treadmill without pain or concern about balance. Its manufacturer notes that the experience is almost like walking on the moon. For someone with limited mobility in his lower body, or for whom pain limits the ability to walk, AlterG can be an ideal tool for getting back on his feet. “With AlterG you get all the gain without the pain,” explains Steve Basta of the California company licensed to produce NASA’s patent. She notes that JRMC’s AlterG treadmill — purchased by JRMC Foundation with more than $40,000 in donations from the community — is only the second of its kind in North Dakota. “We let our wonderful donors know what we needed, and they stepped forward,” says Foundation director Jan Barnes. Installed in July, the treadmill has been a busy addition to the department. It is useful for rehab patients with a variety of conditions. In addition to rehabilitation of stroke patients like Dan Lies, it can be used for those recovering from lower body injuries from accidents and sports incidents. Using AlterG may help rehabilitate those who have had hip and knee replacements. It can be used for neurologic reconditioning after brain injuries, as well as promoting strength and fitness among geriatric patients. The treadmill can also be used for athletic conditioning. When Jerry Fuchs asked orthopedic surgeon Michael Dean, MD, about having his left knee replaced last June, the doctor knew what was on his mind. “Dr. Dean told me, ‘Well, pheasant season starts the beginning of October,’” Jerry recalls. “I asked him whether I’d be able to hunt this fall, and he told me, ‘Absolutely!’” Jerry’s knee was replaced June 18 at JRMC. After five days in the hospital and several weeks of therapy in the Rehab Department, he has his full range of motion back — and is back to hunting and fishing. He’s even doing a little yard work. Story originally published in the September edition of the AppleSeeds Newsletter. 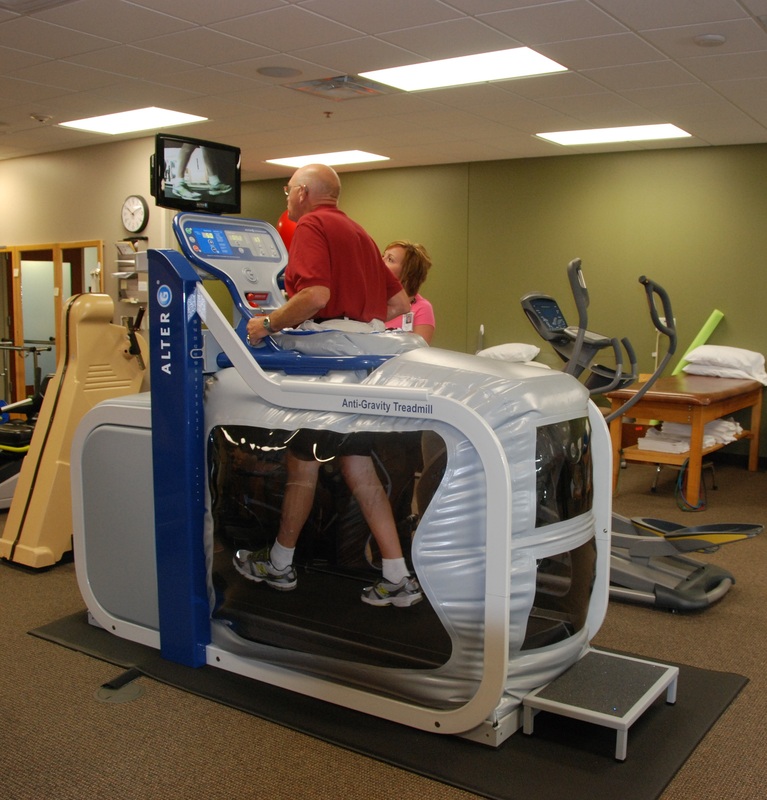 Jamestown Regional Medical Center (JRMC) today announced that the AlterG Anti-Gravity Treadmill, the world’s first and only treadmill using NASA based anti-gravity technology, has been installed to help patients in their short-term rehabilitation programs. Thanks to funds raised by the JRMC Foundation, the rehabilitation department is now able to serve neurological and orthopedic patients better by offering them the opportunity to rehab faster with the AlterG. AlterG Anti-Gravity Treadmills enable faster rehabilitation, safer conditioning for the geriatric population which can help remove major obstacles associated with these activities. Impact on the body and the pain of recovery are reduced, which helps people achieve better results. Patients at JRMC can now rehab better, train smarter, and exercise safer with the AlterG. With the AlterG, patients can run and walk without bearing their entire weight, reducing the impact on the body to optimize rehabilitation and physical therapy outcomes. Its Differential Air Pressure (DAP) technology applies a lifting force to the body that reduces weight on the lower extremities and allows precise unweighting – up to 80% of a person’s body weight, so people can find exactly where the pain stops and natural movement feels good again. There are a multitude of benefits when training and rehabilitating on the AlterG. Patients can use the AlterG Anti-Gravity Treadmill to recover from injury and surgery and it allows them to immediately do partial weight bearing exercises. Patients with neurological disorders maintain, and in some cases even regain functionality and mobility working with the AlterG. “We are fortunate to be only the second facility in North Dakota to have a treadmill of this kind to offer advanced services to our patients,” stated Anderson. AlterG Anti-Gravity Treadmills are designed to be used for lower body injury and surgery rehabilitation, aerobic conditioning, sport specific conditioning programs, neurologic retraining, and geriatric strength and conditioning. About AlterG AlterG, Inc. manufactures and distributes the AlterG® Anti-Gravity Treadmills®, a revolutionary technology for rehabilitation and athletic training. AlterG is great for anyone who wants to reduce impact during exercise or have a smooth rehabilitation after surgery or injury, and is preferred and used by leading medical professionals and the world’s best athletes and teams. AlterG’s unique anti-gravity technology was originally developed at NASA and tested at Nike’s Oregon Research Project by America’s top distance runners and is the only FDA-approved device of its kind. 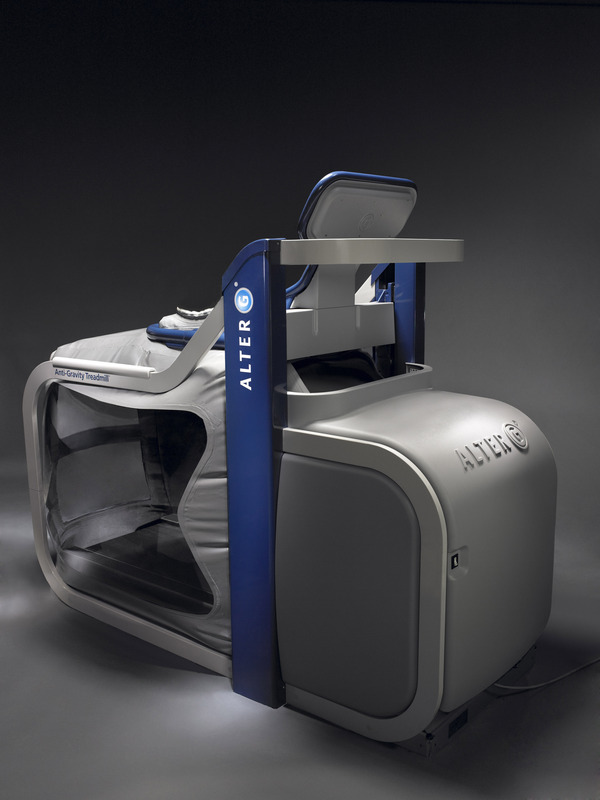 Located in Silicon Valley, AlterG is now selling Anti-Gravity Treadmills worldwide. For more information visit www.alter-g.com or contact the company at info@alter-g.com.